The storage unit for span and stripe metadata. A container that maps from a FQDN to a CacheHostRecord. This is constructed from the contents of hosting.config. Search the table for a match for the hostname fqdn, a string of length len. If found the result is placed in result. A wrapper for CacheHostRecord used by CacheHostTable::Match(). This contains the set of cache volumes for the cache host record and is used to perform stripe assignment. A cache hosting record from hosting.config. The cache volumes that are part of this cache host record. The stripe assignment table. This is an array of indices in to CacheHostRecord::vols. An open directory entry. It contains all the information of a Dir plus additional information from the first Doc. A virtual connection class which accepts input for writing to cache. Performs the initial read for a cached object. Performs the initial read for an alternate of an object. Data transfer driver. This contains a set of producers. Each producer is connected to one or more consumers. The tunnel handles events and buffers so that data moves from producers to consumers. The data, as much as possible, is kept in reference counted buffers so that copies are done only when the data is modified or for sources (which acquire data from outside Traffic Server) and sinks (which move data to outside Traffic Server). Holds the data from a line in cache.config. Defined in iocore/cache/P_CacheHttp.h. This is an array of HTTPInfo objects and serves as the respository of information about alternates of an object. It is marshaled as part of the metadata for an object in the cache. This class is a wrapper for HTTPCacheAlt. It provides the external API for accessing data in the wrapped class. It contains only a pointer (possibly NULL) to an instance of the wrapped class. The key for the earliest Doc of the alternate. The request and response headers. Timestamps for request and response from origin server. This represents a storage unit inside a cache volume. The number of blocks of storage in the stripe. Schedule the aggregation buffer to be written to disk. The number of segments in the volume. This will be roughly the total number of entries divided by the number of entries in a segment. It will be rounded up to cover all entries. The number of buckets in the volume. This will be roughly the number of entries in a segment divided by DIR_DEPTH. For currently defined values this is around 16,384 (2^16 / 4). Buckets are used as the targets of the index hash. Array of of EvacuationBlock buckets. This is sized so there is one bucket for every evacuation span. Length of stripe in bytes. Start an evacuation if there is any EvacuationBlock in the range from low to high. Return 0 if no evacuation was started, non-zero otherwise. Validity check value. Set to DOC_MAGIC for a valid document. The length of this segment including the header length, fragment table, and this structure. Total length of the entire document not including meta data but including headers. First index key in the document (the index key used to locate this object in the volume index). The index key for this fragment. Fragment keys are computationally chained so that the key for the next and previous fragments can be computed from this key. Document header (metadata) length. This is not the length of the HTTP headers. Fragment type. Currently only CACHE_FRAG_TYPE_HTTP is used. Other types may be used for cache extensions if those are ever implemented. Fragment table length, if any. Only the first Doc in an object should contain a fragment table. The fragment table is a list of offsets relative to the HTTP content (not counting metadata or HTTP headers). Each offset is the byte offset of the first byte in the fragment. The first element in the table is the second fragment (what would be index 1 for an array). The offset for the first fragment is of course always zero and so not stored. The purpose of this is to enable a fast seek for range requests. Given the first Doc the fragment containing the first byte in the range can be computed and loaded directly without further disk access. Flag and timer for pinned objects. Header for a span. This is a serialized data structure. Holds a magic value :code:DISK_HEADER_MAGIC to indicate the span is valid and initialized. Number of cache volumes containing stripes in this span. The number of span blocks defined but not in use. The number of span blocks in use by stripes. The number of span blocks. The number of volume blocks in the span. A flexible array. The actual length of this array is num_diskvol_blks and each element describes a span block. A description of a span stripe (Vol) block . This is a serialized data structure. Offset in the span of the start of the span stripe (Vol) block, in bytes. Length of the span block in store blocks. 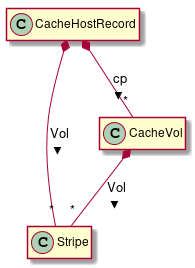 The cache volume index for this span block. Type of the span block. In use or free flag - set if the span block is not in use by a cache volume. Container for a magic value, VOL_MAGIC, to indicate the instance is valid. Epoch time when the stripe was created. Position of the write cursor, as a byte offset in the stripe. Location of the write cursor of the most recently completed disk write. The byte offset in the stripe where the current aggregation buffer will be written. An array of directory entry indices. Each element is the directory entry of the start of the free list for a segment, in the same order as the segments in the directory. An enumeration of value CacheType::HTTP or CacheType::Stream. This class represents an individual volume. Base object for a cache. A generic class: CacheHostRecord that contains all cache volumes that are not explicitly assigned in hosting.config. Compute the stripe (Vol*) for a cache key and host. The host is used to find the appropriate CacheHostRecord instance. From there the stripe assignment slot is determined by taking bits 64..83 (20 bits) of the cache key modulo the stripe assignment array count (VOL_HASH_TABLE_SIZE). These bits are the third 32 bit slice of the key less the bottom DIR_TAG_WIDTH (12) bits. Changed in version 3.2.0. This previously resided in the first Doc but that caused different alternates to share the same fragment table.